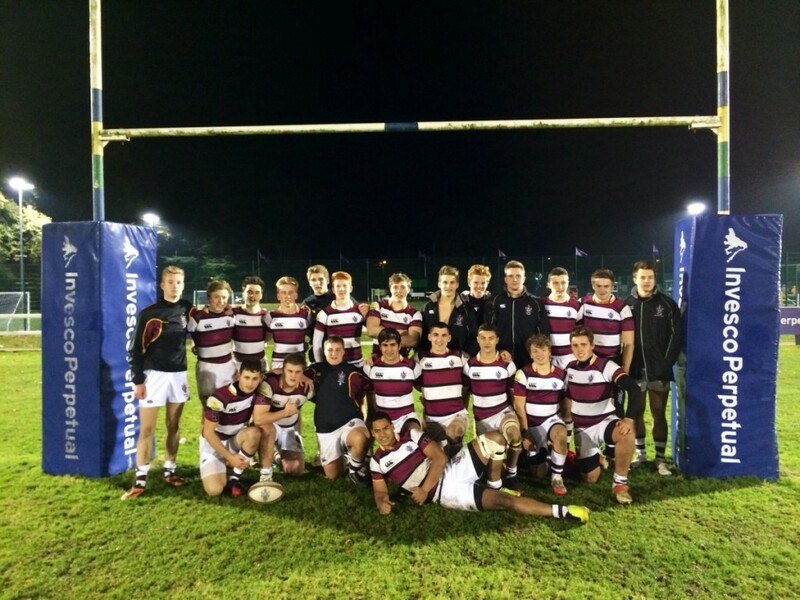 Shiplake overcame a slightly hesitant start to make the most of the huge home support under the floodlights at Henley Hawks Rugby Club and record a resounding victory in Friday Night Lights 2013. Both teams were keen to settle the nerves by getting early points on the board, but Shiplake missed a difficult penalty whilst opponents Merchant Taylors’ School hit an upright with a similar chance. When Shiplake gave away a penalty, Merchant Taylors put together a number of strong phases to gain territory. Another penalty gave their number five the opportunity to charge through when Shiplake were slow to react and his try was converted to give the visitors a 0 – 7 lead. Bodie Deane brought Shiplake back into the game when the number eight picked up from the base of the scrum and charged over the try line, carrying two defenders with him. Tom Howe, Shiplake Old Viking and London Wasps’ Winger, then announced over the commentary that younger brother Toby had levelled the scores with his conversion. With confidence rising, Fili Savou and Jake Long made a number of storming runs. Then, fielding a kick into Shiplake’s half, Long gathered the ball, beat a trail of despairing defenders and touched down to help Shiplake to a 14 – 7 half-time lead. Moving into the second half, Savou was first to react to some scrappy play in the Merchant Taylors’ 22 as both teams failed to cling-on to possession. Savou gathered, sprinted through and scored to give Shiplake some welcome breathing space. Minute laters, Howe saw space and kicked for Long to chase. Long, later named as Man-of-the-Match and attracting attention from the touchline scouts, capitalised on a defensive error for his second try of the night. Finally, Savou sealed an emphatic victory for Shiplake when substitute scrum-half Billy Sayers opted to feed Toby Howe on the blindside and Savou stormed over the white-wash for his second try. Alex Collis, Shiplake Captain, was delighted with the improving discipline of his team. After conceding a couple of early penalties Shiplake tuned into the referee’s law interpretations and committed very few indiscretions. It was a great night for Shiplake rugby as earlier in the evening, as the curtain-raiser, Shiplake’s U12 team had enjoyed a good win over Gillotts’ U12s and Shiplake’s U13s had emerged as winners in their tight game against the same school.